Did I save the best for last? The one limited-edition eye shadow quad from Chanel's new collection of Les 4 Ombres Multi-Effect Quadra Eyeshadows is Poésie (#234, $61). I had seen many photos of it online - all deceptive in some way it turns out. I purchased it sight unseen, and when I finally got my eyes on the real thing, I almost drooled. I know many of you have already purchased Poésie and sung its praised - for very good reason. It's a stunner. The color in the lower right that I had assumed from press photos and other bloggers was a shade of burgundy? It's not. Yippee! I took photos in very late-afternoon sunshine. I swatched from upper left in the quad, moving clockwise and ending on my arm with the pink at lower left. I used a sponge-tipped applicator and swatched relatively heavily. Just look at these unbelievably gorgeous shades! The bronze at the top of my arm has a touch of rose in it, making it "rose bronze," one of my recent favorites. The flesh toned shade is a perfect base or even highlighter. It won't set the world on fire, but it coordinates perfectly with the other shades. What color is the darkest shade? I think it's a hybrid representing shimmering brown and rose. I do not see burgundy, eggplant, or any of the other shades that have been used to describe it. It is totally gorgeous on my skin and does not make me look tired, as so many red shades do. The shimming pink may not be unique, but it complements the rest of the shades so well, I'm in love with it too. How nice does it get? In case you didn't see this note from a Chanel friend, the applicators that come in the quad are velour. They give a completely different look than a sponge applicator or a brush. If you do use a brush, try Chanel's #14. The quads are not frosted, but have a luminous sheen which will soften aging and camouflage lines and wrinkles on the lids. Good news for everyone over 50! The new Chanel quads are widely available, but Poésie was distributed in very limited numbers. Call before you zoom over to your favorite Chanel counter. Among Bobbi Brown's beautiful Surf & Sand Collection, you'll find stripes, which Bobbi perfected years ago with her Shimmer Bricks. Since then, she has experimented with stripes of different widths. Her wildest strips were probably the gold and silver ones in her holiday Party Palette from a few years back. The stripes in her new limited-edition Bronze Brightening Blush ($45) and limited-edition Pink Brightening Blush ($45) are tame and extremely flattering on the skin - they offer a touch of summer color. Speaking of summer, look at the steam from humidity on the mirror on the Bronze Brightening Blush at left above. Do you think it was hot outside at high noon when I took that picture? I have very little time to write today, so let's go right to the swathes. I used a sponge-tipped applicator and ran it across all three shades, applying the bronze at the top of my arm and the pink below. Both applications were heavy. Then I took a kabuki brush and applied the blended bronze shade below the stripe swatches. I applied the two stripes heavily. The bronze is a beautiful, gleaming color, and when applied appropriately. Tthis lightly pearlized blush delivers a soft wash of lit-from-within color. It looks natural. Bobbi recommends that you apply it with her Blush Brush, and I agree. That brush will add color lightly, giving you the opportunity to add more if you wish. The pink is extremely sheer and light. Also offering pearlized color, it's best on women with fair skin. I don't see it adding much of a glow to those with darker skin. Maybe I'm incorrect, so tell me if I am. I think these are beautiful compacts - stripes and all - and I am pleased to have them. Right now, Bobbi Brown has an incredible deal on her Web site. Spend $100+ on your order and you will receive a $25 bonus card to spend later. That'a basically a 25% discount. Not bad! 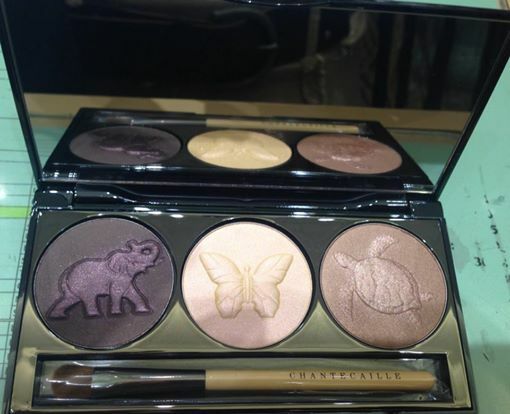 Take a look at Chantecaille's 15th Anniversary Palette! It's due in stores this weekend. I'll take four, please. More to come on this beauty. Bobbi Brown added new shades to her Sheer Lip Colors ($26) for the season. Naturally, I jumped right in when I saw there were new options for me. I selected three new shades: Sunlit Pink (#18), Peach Sorbet (#20), and Pink Taffy (#21). The sheer lip look of the season is a lightweight formula that delivers an effortless wash of color plus nourishing shine. The best part? Formulated with luxurious shea butter, murumuru butter, and apricot kernel oils, Sheer Lip Color rejuvenates and nourishes the overall condition of the lips instantly and over time. 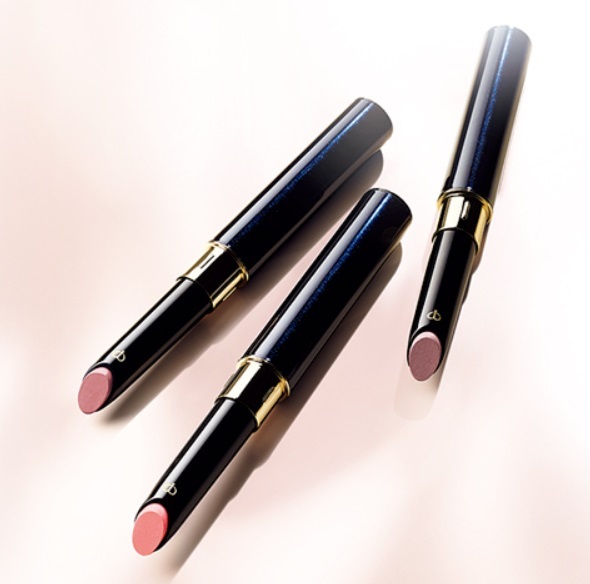 This beautiful lip color glides on smoothly and evenly and yields hours of feather-free wear. Available in a range of creamy and shimmery shades, the the hardest part of using Sheer Lip Color is having to choose your favorite colors. Here are my three new shades, Sunlit Pink (#18), Peach Sorbet (#20), and Pink Taffy (#21) from left to right. I'm sorry they aren't evenly lined up. They were rolling around on me as I tried to get a photograph of the three little soldiers. I will skip right to the swatch photos to show you how pretty they are. I swatched in numeric order, starting at the top of my arm with Sunlit Pink (#18). My photos were taken in full, early afternoon sunshine. It was very bright outside. I absolutely adore Sunlit Pink, despite the fact that I would have called it rose bronze. It's more brown than pink. It's gorgeous on the skin and the lips. The shimmer adds volume to my lips. It has plenty of color while remaining sheer. I'm smitten! The shade in the middle, Peach Sorbet (#20) is also a little oddly named. I see it as a warm pink. I do see peach tones in it, though. Like Sunlit Pink, it's gorgeous on the skin and the lips. The shimmer adds volume, and it offers plenty of color while remaining sheer. The lightest shade, Pink Taffy (#21) is very sheer. A baby pink, it's pretty, but not the stunner like the other two. If you'd like to see my earlier feature on Bobbi's Sheer Lip Colors, click here. You can find these lovely lip colors at Bobbi Brown's Web site and all Bobbi Brown counters. Chanel's Dentelle Précieuse Illuminating Powder ($80) has been exclusive to Nordstrom, a beauty feature of the Anniversary Sale. I was given an extra-special courtesy when I was allowed to purchase it slightly before the end of pre-sale (I do not carry store cards). Then I forgot to take photos. Duh! This lacy luxury is a very special girl. She comes wrapped in a fold-over pouch with an elastic band to keep her in place. There is a place for her brush in the pouch. Her box is even large, giving her the aura of a collector's piece. 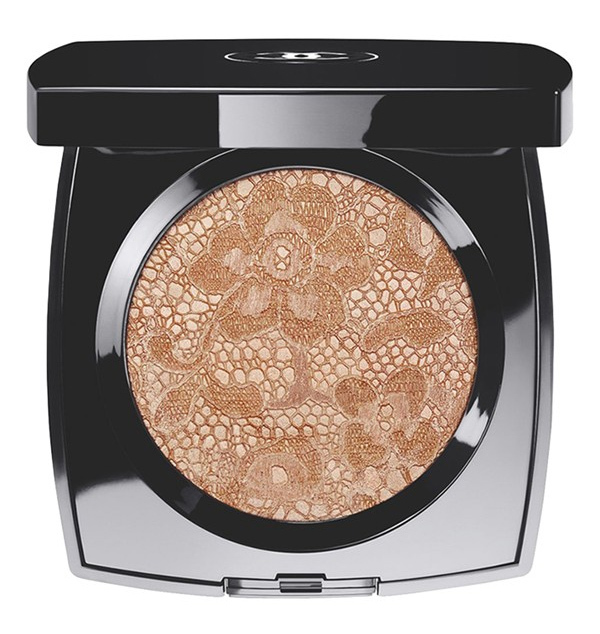 We tried the tester on my skin before I purchased Dentelle Précieuse Illuminating Powder. It looks beautiful on my pale face. I do wonder how it will appear on very dark skins. It might disappear because it is pastel and soft when applied. I think it's magnificent on my skin. Note the difference in color between my photo, directly above, and the Nordstrom/Chanel photo at the top of this feature. The real color is closer to the Nordstrom/Chanel photo, but lighter. I was not wearing pink, nor were there any pink flowers near me when I snapped my photo in full sun. That pink cast is a mystery. We'll let the swatch photos prove that. I took them in full, early afternoon sun. I used a sponge-tipped applicator to apply the powder extremely heavily at the top of my arm. Then I used a kabuki brush to show you a moderate swatch below. The nice thing about this powder is that I can achieve any look I want by varying the brush I use. I prefer to use a fluffy cheek brush to apply a sheer veil, which suits my everyday look quite well. You can see the beautiful, soft gold shade in both swatches. I do not see the pink on my skin. Do you? I think it's a perfect gold for everyone. It was a nice choice on Nordstrom's part. As you can see, it is sparkly, but not overly so. It's pretty and girly, not garish or glittery. It stays on too. I'd estimate five-hour wear. It does not make it all day when applied lightly. "But of course," some will say to me. What do you expect when Nordstrom teams up with Chanel? I'd like to see this highlighter distributed to all the Chanel counters so that everyone can take a look and see whether it will make a nice addition to their makeup wardrobes. I just tried to find it on Nordstrom's Web site and couldn't. I'm wondering if it sold out there. Surely the stores still have it available. If you would like to see more photos, check out Sara's at Color Me Loud. I found it interesting that she also captured the pink tone in the compact. I love my new illuminating powder. It stands out among the hundreds I already have. That's an achievement! Here's a big-time sale alert, but it's only good for today. NEST Fragrances is offering 50% off its Beach Collection and a few other wonderful items. The sale will end tonight. You must use this link, and you must enter the promotional code of CHANNEL7. Your shipping should be free. This is an ABC "secret sale," but I have permission to share it with you. As soon as I got the code last night, I pounced. 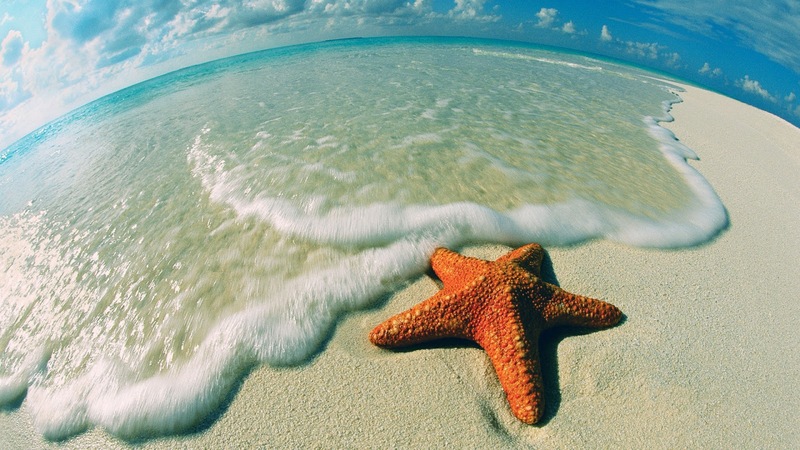 I love Beach. A fresh, aquatic fragrance, Beach captures the essence of sparkling turquoise water and lush coconut married with juicy melon and a luminous base of lotus flower and sensual woods. It is divine, and, of course, especially this time of year. I'm enjoying my new Clé de Peau eye shadow quads. It's ironic, though, that today I'm wearing one of last spring's introductions. I used the large portion of a flesh-toned shade to cover my lid under the crease and then blended in the prettiest teal green shade into the outside corner. Since I'm wearing black and white today, my eye shadow jazzed up my look. I do have some knee news, but it will probably stun you as it did me yesterday, when I went for my second opinion. After four emotional months (plus) of believing that my bionic knee had come loose from the bone (per the doctor's diagnosis), I learned that the prosthetic itself is fine. It is still attached to the bone on both ends. My ligaments around the knee have stretched! They call it ligamentous laxity. The good news is that they can cut into my knee again (well, relatively good) and replace the plastic "spacer" between the two metal piece parts, which will make my knee equal the ligament length properly, and all should be fine. The recovery is not supposed to be gruesome as it was on the original replacement, so I should be able to follow with a right knee replacement after a relatively short period of time. My right knee has reached the agonizing stage pain-wise, so I am ready. I was stunned when I got this news from my surgeon's own partner! How could two accomplished physicians - both on the best doctor's list - come to such entirely different conclusions? I asked the politically insensitive question to the second surgeon, "Will you do my surgery?" He said yes - that the first doctor wouldn't be upset. So it looks like I'll be going in for new plastic. I'll wait until summer is over since he said a delay would not harm anything. He actually said the surgery wasn't totally necessary, but I don't want to live with the pain. He recommended I keep going to physical therapy to strengthen my thigh muscles. I was pretty excited when I saw the Fresh was offering a new mask. Called Peony Brightening Night Treatment Mask ($65), it was enticing. I love masks; I love masks that can be left on overnight; and I love Fresh (as a rule). The photo at Sephora showed a pump dispenser, the key to my heart. What could go wrong? A powerful overnight treatment, says Fresh, Peony Brightening Night Treatment Mask is proven to lighten the appearance of dark spots, correct uneven skin tone, and significantly brighten the complexion. The highly concentrated overnight treatment formula is also proven to replenish and preserve hydration for 24 hours, promote suppleness, and smooth skin texture so you awake to youthful-looking, luminous skin. An exclusive brightening complex derived from peony and licorice root extracts and vitamin C glucoside has been proven to reduce and prevent the appearance of dark spots and even skin tone, while amino acids help to visibly firm and smooth wrinkles. The formula is further enriched with cucumber extract, notable for its hydrating and calming properties. 81% said the product restored youthful contours. I wish. Unfortunately, I found the mask to be somewhat unpleasant on application because of its scent, and I experienced no treatment benefits. I definitely fall into the 13% of testers who found no complexion improvement after one night's use. The mask is a cream and dispenses easily into my palm using the pump dispenser. So far, so good. As I start to apply it (I've used it twice), I notice a synthetic fragrance with a slight resemblance to Lemon Pledge. I'm sure that's from the Lemon Peel Oil or possibly the Limonene, which is used for its scent in cosmetic products. Unfortunately, it's also used as a cleaning solvent. Fortunately, it's close to last on the ingredient list. I don't smell peony at all, one of the benefits of the many beauty products that are "based on" the peony's recognized beneficial effects. 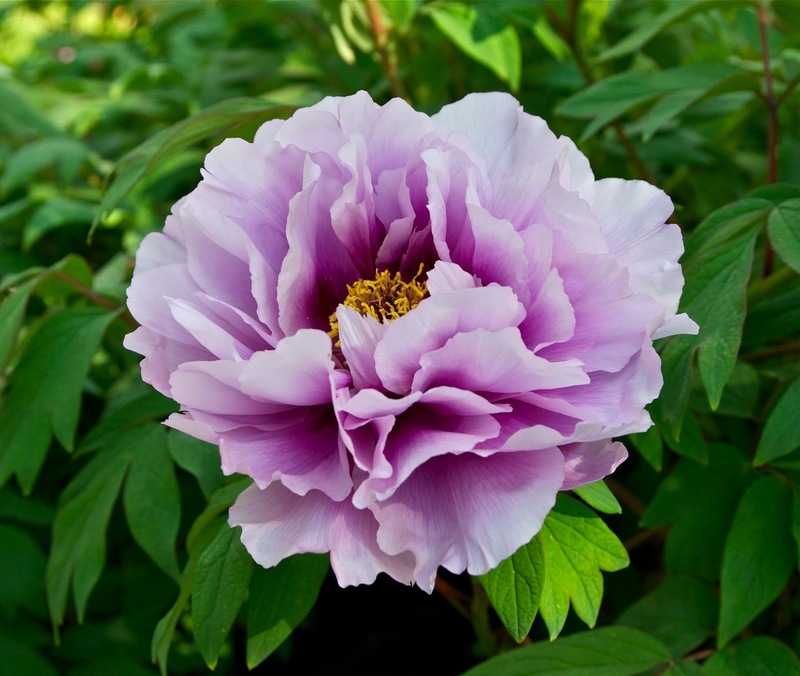 The peony's root is extracted for the product, not the flower. That's too bad because the scent of the peony flower is divine and might have flipped my impression of the product. It's moisturizing, no doubt due to the sodium hyaluronate (remember, nature's sponge) in the ingredients. Simply being moisturizing doesn't give it an edge over my other hydrating masks. I'm blown away by the complimentary "reviews" on Sephora. I cannot imagine how small amounts of licorice and vitamin C could even skin tone overnight. I guess there are women who read the claims and believe them so strongly that they transfer hope into evidence. In general, I love Fresh products. In my opinion, this one misses the mark. I find the scent mildly unpleasant, and masks are supposed to be pleasant and relaxing. Fortunately, the scent dissipates fairly quickly. The cream absorbs quickly. That's good so that users won't leave grease slick on their silk pillows. Does it offer any advanced properties to improve skin tone, decrease dark spots, or brighten the complexion. I believe the answer is no. Sorry, but it's not worth the $65 price. Spend your money on one of my favorite masks. I have featured all of them. Here's Clé de Peau Beauté's Eye Color Quad in #301 ($55), the third of the three I purhcased. This one is "interesting." I usually look for palettes to have coordinating shades, often ranging from a light base shade to a dark accent or liner shade. 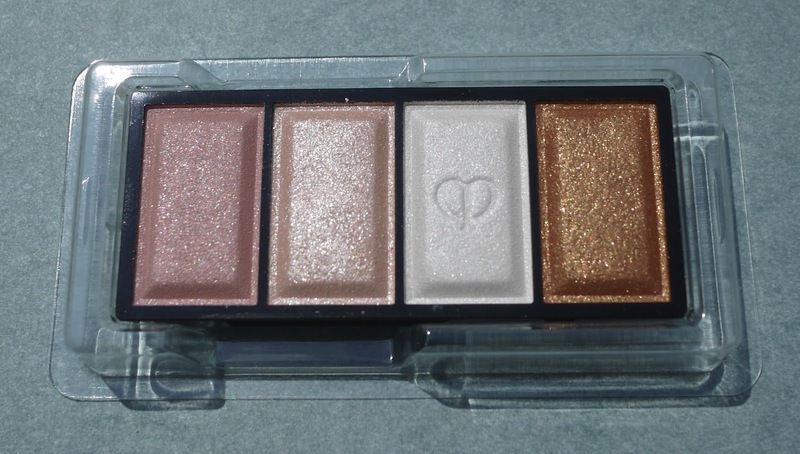 This quad features four hightllighters. I'll go straight to the swatch photos to "make my point." I took my photos in full, late-morning sunshine. I swatched from left to right as I moved down my arm. I swatched using a sponge-tipped applicator, applying each shade relatively heavily so that you could see the shimmering shades well. The pink at the left in the quad is a nice, light pink - not too blue, but nor warm either. What appears to be light gold in the palette is actually an ivory/flesh tone on my skin. The white shade is bright white. It jumps off the skin with its whiteness. The only shade with a suggestion of "real color" is the antique gold. It's very pretty, but seems disconnected from the other three shades. My impression is that Clé de Peau created #301 to accompany every other quad in the collection, offering highlighters and plenty of options. Naturally, one can create a pale eye with this quad, and that might be beautiful on Asian skin tones. I'd like to see it used. 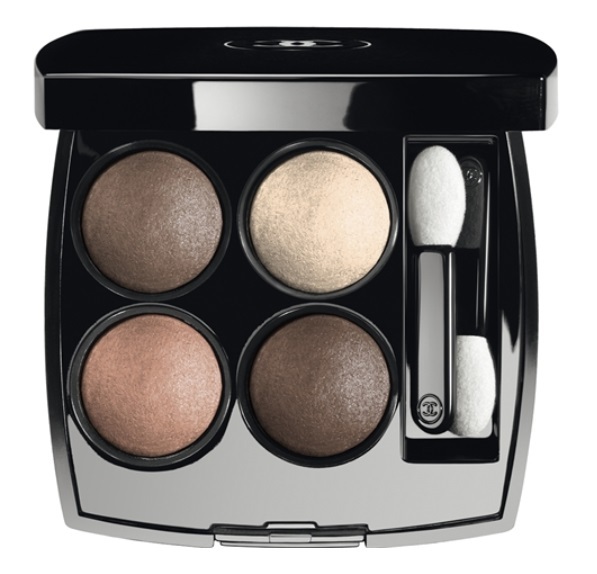 You can find the new Clé de Peau Beauté Eye Color Quads at very few sites so far. I purchased in store at Neiman Marcus. They can be found online at Saks in the What's New section. Otherwise, keep checking your favorite source for Clé de Peau Beauté. The collection should arrive within two weeks. Nordstrom told me they expected it in store late this week. Next up in my three-hit run at the Clé de Peau counter is Eye Color Quad #305 ($55 for refill). I was immediately drawn to it, primarily because of the three brown shades. I call it my second favorite of the three, but it may overtake my current favorite, #302. Those greens and browns may have a go at it for my affection. There's not a lot I can tell you about these new quads that I haven't already mentioned. So I'll go straight to the swatch photos. I took my photos in full, late-morning sunshine. I swatched from left to right as I moved down my arm. I swatched using a sponge-tipped applicator, applying each shade relatively heavily so that you could see the shade well. You see why I love these shades? The shimmering tan shade at the top is cool (in tone) and totally gorgeous. It works beautifully with each shade in the palette. The dark copper/bronze, like so many other palettes featuring copper, is unique in its shade. That's nice in the sea of copper and bronze that has surrounded us recently. The shimmering taupe is exquisite. Simply exquisite. Taupe lovers unite! This shade alone makes the palette worth the entire $55. The dark deep brown charcoal accent shade can be worn as a liner. I see in "real life" a touch of plum in it. You can't see it in my photos, but that plum snuck in is consistent with the many lavenders in this collection. It is very sparkly too. I will show you the remaining quad I purchased tomorrow. For now, after a day that started at 4:30, a full day of work, a trade of my car for a loaner at the dealer (my key needs an exorsism - really! ), and a physical therapy session, I'm pooped. 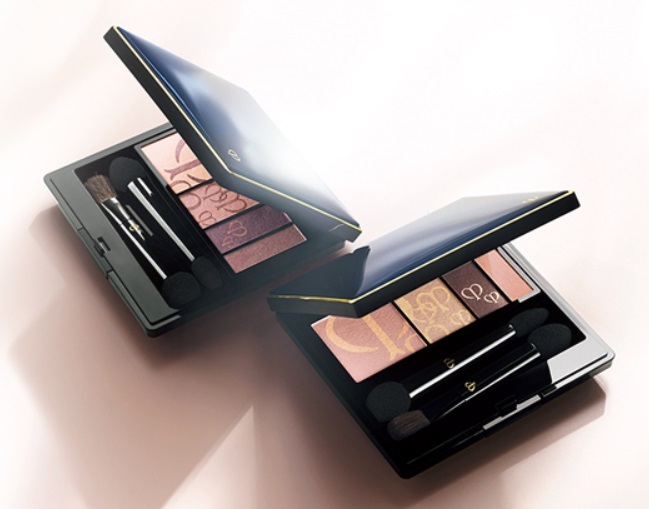 You can find the new Clé de Peau Beauté Eye Color Quads at very few sites so far. I purchased in store at Neiman Marcus. They can be found online at Saks if you use the link above. Otherwise, keep checking your favorite source for Clé de Peau Beauté. The collection should arrive within two weeks. Nordstrom told me they expected it in store late this week. 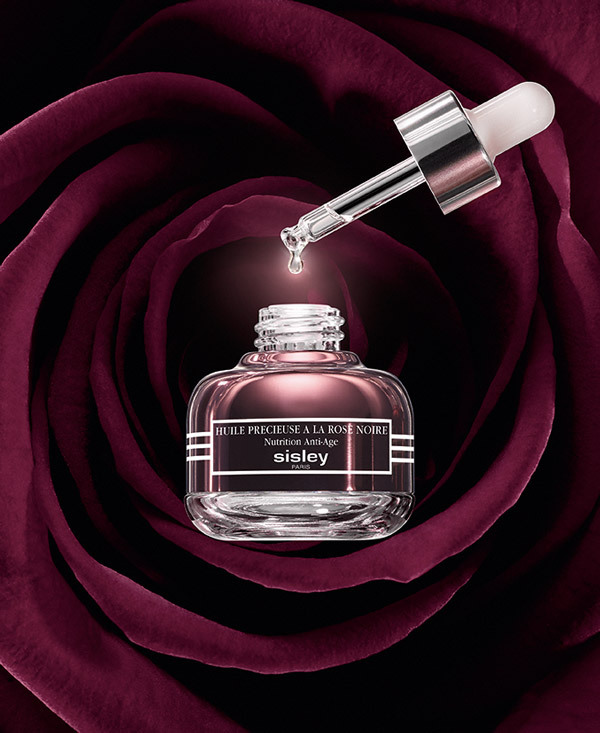 I had a chance this weekend to try a sample of Sisley's new Black Rose Precious Face Oil. My first impression was one of love. It is luxurious in every aspect if its being: fragrance, feel, absorption, and hydration. Nourishing and anti-aging dry oil with a delightful floral fragrance. Visibly smoothes wrinkles and fine lines. Revitalizes the skin and brightens the complexion. Can be used alone or as a base for daily care to prepare the skin for optimal benefits. Suitable for normal to dry or very dry skin, as well as sensitive skin. This is clearly a follow-on to the wildly successful Black Rose Cream Mask, which I adore. Now, breaking ground, this is the first time Sisley is using an oil based product as a facial skin-care product. I can predict it's going to be a mega-launch when it arrives on U.S. shores. I do not yet know the price. Stay tuned. I want a case of it, so I hope it's affordable. I purchased three new quads from Clé de Peau Beauté's fall's Celestial Beauty Collection. They had arrived at Neiman Marcus. There are eight available. I might have purchased more, but a majority of the quads offered at least one lavender shade, and lavenders are not my best colors. Take a look above at #302 above, and you will see that the only difference between the old design and the new one is that Clé de Peau has finally seen the light and made all four shades equal in size. 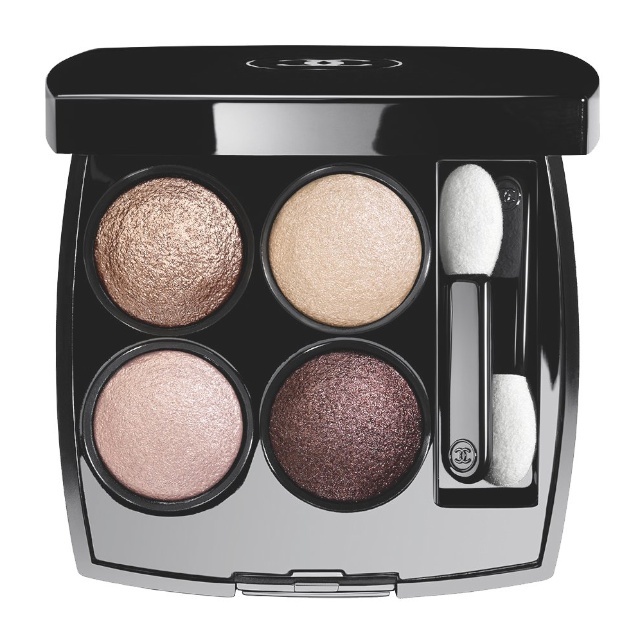 Besides the silly case price, the only thing that bothered me about Clé de Peau eye shadow quads was that they were less then generous with the tiny sliver size to the extreme right in the old quads. I have not yet detected any major difference in formula, although I've only had these new eye shadows for a few days. I always purchase Clé de Peau Beauté Eye Color Quads ($55) in refills. The plastic containers are perfectly functional, with a lid, and I don't want to pay an additional $25 for a case. It seems so unnecessary. I'm glad I was able to get photos this morning because it has been totally clouded over since about noon. I took my photos in full, late-morning sunshine. I decided to start this series with my favorite of the three I purchased, #302. I swatched relatively heavily with a sponge-tipped applicator, starting at the left of the palette and moving toward the right as I worked my way down my arm. All four shades shimmer. The light, ivory pink at the left in the palette is very pretty. It's more flesh-toned than pink on the skin. The olive green is unique and glorious. I love it! I think it's the centerpiece of this quad. The darker pink is an interesting hybrid between heather pink and beige. It will work well for most skin tones, and it definitely does not lead to an albino bunny look. 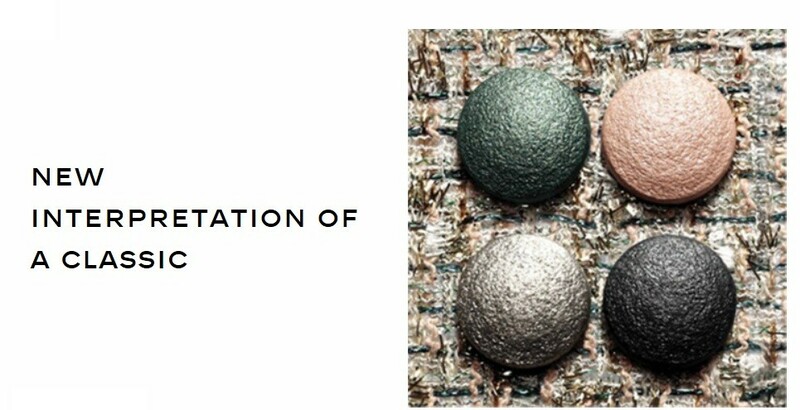 The metallic shade, far right in the palette, will reflect an undertone of green when worn with green; however, it's actually a charcoal grey. I haven't had a lot of time to wear these eye shadows, so I'll report in a subsequent feature on wear time. It seems average to me at the moment. I'm not sure where you can purchase this collection. Even Neiman Marcus did not have the entire collection - just the eye shadows and mascaras. Keep checking your favorite source for Clé de Peau Beauté. It should arrive within two weeks. Nordstrom told me they expected it late this week. 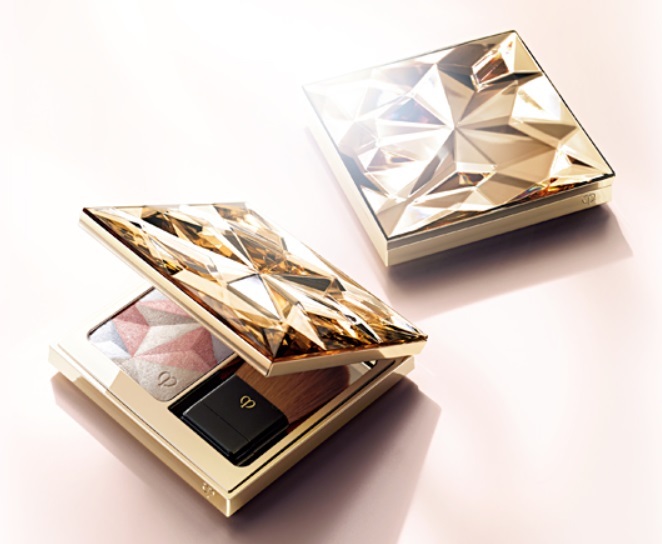 I seldom get this frustrated over makeup, but I am frustrated today that I cannot find the whole Fall 2014 Clé de Peau Beauté collection in any one store. I made quite a few phone calls yesterday and succeeded in finding the eye shadows at Neiman Marcus, Tysons Galleria. I hope to get over there late this afternoon. There are apparently 12 new eye shadow quads (edited - there are eight). Some of them look suspiciously like quad I already have (edited - because they were! ), but I'm very anxious to see and play with them. Perhaps they improved the formula, like Chanel did? I'm leaving these Clé de Peau photos up because they are beautiful - as pretty as anything else I could use to jazz up this Friday Forum. The photos here are the last (spring) collection, which Clé de Peau unfortunately still has labeled "new" on its Web site. I think when a truly new collection hits the counters, the Web site should be updated. I may pass on the lips this season (edited - later I saw that the new lipsticks are not these thin-line ones). I find the refills hard to use without the tube, and the tube costs extra. Anyhow, I'm very excited about the fall collection, as well as what's coming from other companies for fall and holiday. I got a sneak peak at Chanel's holiday collection, and I can only tell you to save your money. You are going to want one of everything - and I've got some Chanel friends who would love to help you part with your money (wink). This makeup has helped take my mind off the tragedy of the Malaysian Airlines plane crash, which horrifies me. What kind of sick mind set could lead people to shoot down a civilian airliner? How on earth did humans become so heartless? If the pro-Russian rebels did it, what did they hope to gain? On to a happier subject, it's time for our weekend sharing, the Friday Forum. I love this part of our week. What new products did you discover this week? Did you find any deals you couldn't resist? 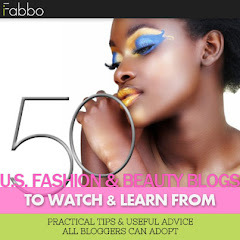 Are you using a fabulous product and want to sing its praises? Did you find a beauty product disappointing? Do you have a question others might be able to answer? Want to talk about skin care? What's new in your life? Just use the comments. Don't be shy. Just make sure to ask any question you might have over the weekend. By early the next week, most (not all) readers will have moved on. Update: I went to Neiman Marcus. Score! I saw all eight of the new Clé de Peau Beauté quads and selected three, #301, #302, and #305. I found it interesting that a majority of the quads had at least one lavender shade in them - clearly a trend. That disappointed me, given my personal preferences. The photo above shows my selections. There are three new lipsticks, but only the testers have arrived. I have my eyes on one of them. As soon as I can, I will swatch these new fall quads for you. No need to comment further on the spring photos. I'm leaving them up for eye candy. The applicators that come in the quad are velour. They give a completely different look than a sponge applicator or a brush. The quads are not frosted, but have a luminous sheen which will soften aging and camouflage lines and wrinkles on the lids. Good news for everyone over 50! Have Chanel's Brush #14? Give it a try for application. When I looked at Les 4 Ombres Multi-Effect Quadra Eyeshadow in TISSÉ CAMÉLIA (#202, $61), I wondered what I had been thinking when I ordered it. Pink? Lavender? Honestly, I think I got confused. Nevertheless, it's pretty and can be worn under some conditions, i.e., when I don't look tired. I try to avoid bright pinks and lavenders. They make me look tired or bruised, while they make women with other skin tones or eye colors look fabulous. There's something for everyone, right? Fortunately, this one is not outré. The colors are muted. I took my photos - quad and swatches in mid-morning. I swatched using a sponge-tipped applicator and started with the lavender in the upper-left corner, moving clockwise around the quad as I worked down my arm. I'm glad the lavender, shown at the top of my arm, isn't very red. It's actually mauve to my eyes, and I think I can wear it - carefully and layered or blended with a color that mitigates any red it carries. The lovely near-white base shade is as perfect as any of the base/highlighter shade in the new quads. The darkest shade surprised me. I was not expecting it to look charcoal on my skin, but it does. I expected a color that was more like the color that I saw in the compact. The pink? It's bright pink on me. I try to select pinks that are more subtle. I know this quad will have many devotees. I don't want you to shun it - it's really pretty - because of my personal preferences. The not-so-wonderful-for-me shades are going to delight many women. Because I think ordering it was a mistake on my part, it is my least favorite of the four I ordered. Now, I am tempted to order one or two more from the collection. I might. I'm trying to stay strong, telling myself I have enough - enough makeup. Do I really need a few more quads? I guess you will find out soon enough. 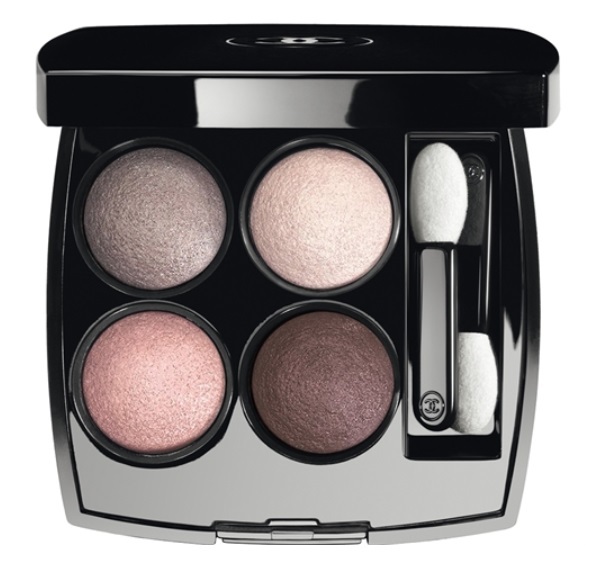 The new quads are winging their way to all Chanel counters and online retailers now. I know from comments that many of you have already selected and purchased your favorites. For those who haven't sprung for one of the new quads, make sure to look for the collection soon. I hear it is being unveiled Saturday at one local Neiman Marcus. I published helpful sources in the Introduction. Now, because of a storm, I must shut off my computer. I will monitor for comments on my iPad. Good night! Of the two new Chanel Les 4 Ombres Multi-Effect Quadra Eyeshadows ($61) I purchased, but haven't featured already, this is the one I like the most: TISSÉ MADEMOISELLE (#214). I'll tell you why tomorrow when I post the fourth and final one. TISSÉ MADEMOISELLE offers the neutral eye shadow lover a perfect palette. The browns and beiges are perfect for those of us who want to accent our eyes without a lot of color - especially for work. I took my photos - quad and swatches in mid-morning. I swatched using a sponge-tipped applicator and started with the taupe in the upper-left corner, moving clockwise around the quad as I worked down my arm. I think this is a beautiful quad. All the shades complement one another. The taupe at the top of my arm is a warm taupe, but not so warm that it looks muddy. The ivory under it is a perfect base shade. The true brown surprised me, only because it appears to be darker on my skin than it looks in the compact. This is a cool, shimmering brown, the opposite of the taupe at the top of my arm. It's very pretty, just not what I expected. The gorgeous, shimmering gold at the bottom of my arm is a shade you will want to wear with other quads from this collection - or other shadows in your wardrobe. It enhances the eyes, and you can wear it anywhere on the lids - from under the brows to under the lower lashes. It's sheer and versatile. I summarized the qualities of the new Les 4 Ombres Multi-Effect Quadra Eyeshadows here, in an earlier feature. I don't see any reason to repeat them. If you are new to this Chanel series, just pop over to the hyperlink above on "here." I have one more to show you - tomorrow. I blind-ordered all four of my new treasures, purchasing from Chanel's Web site. The new quads are winging their way to all Chanel counters and online retailers now. I know from comments that many of you have already selected and purchased your favorites. For those who haven't sprung for one of the new quads, make sure to look for the collection soon. I published helpful sources in the Introduction. 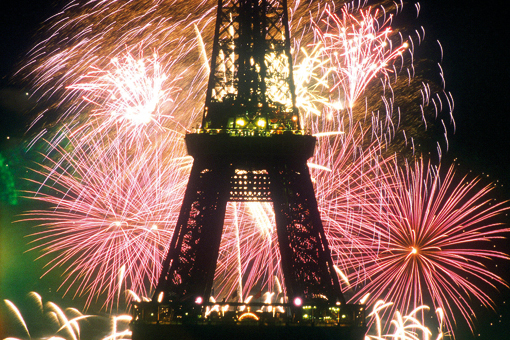 Bastille Day is the French National Day which is celebrated on July 14 of each year. In France, it is formally called La Fête Nationale (The National Celebration) and commonly le quatorze juillet (the fourteenth of July). It commemorates the 1790 Fête de la Fédération, held on the first anniversary of the storming of the Bastille on July 14, 1789. The anniversary of the storming of the Bastille fortress-prison was seen as a symbol of the uprising of the modern nation - and of the reconciliation of all the French inside the constitutional monarchy that preceded the First Republic during the French Revolution. I hope my readers and friends from France have a wonderful day! We'll be celebrating your Independence Day with you. 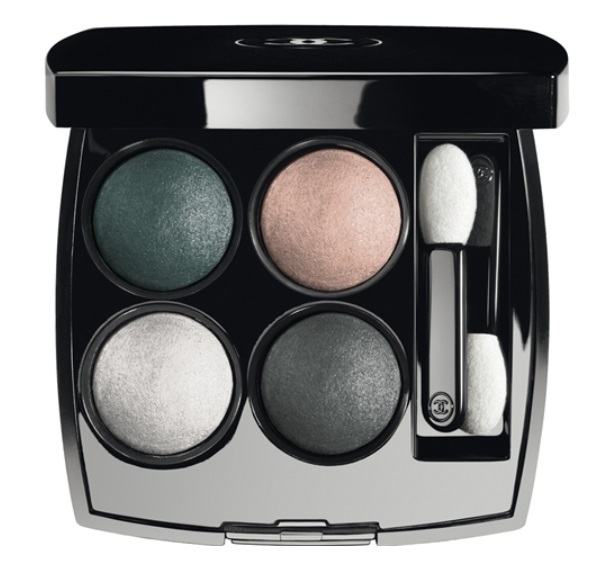 This Chanel photograph caught my attention before I saw any of the new Les 4 Ombres Multi-Effect Quadra Eyeshadows ($61). 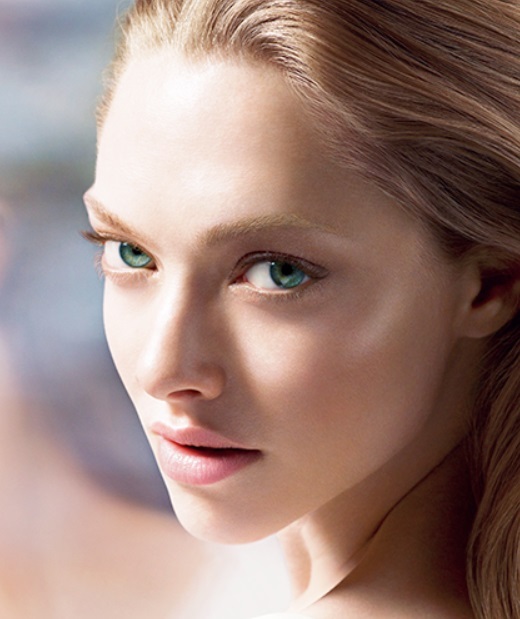 The model's eye color is similar to mine, and I love green eye shadows. I stared at it wondering how quickly I could buy that shadow, which turned out to be TISSÉ VENITIEN. I ordered it the next day. TISSÉ VENITIEN (#232) is magnificent. It was the quad that I chose to introduce the new collection. These colors make my heart race. I feel like an artist who has just discovered an entirely new palette, and I can't wait to explore its variations. I didn't see the shadow of myself when I took my own photo of TISSÉ VENITIEN, and now I'm too "limpy" to zoom outside and take another. "Limpy" is my new term for times when my knees are screaming at me, "Don't you dare move!" I summarized the qualities of the new Les 4 Ombres Multi-Effect Quadra Eyeshadows here, in yesterday's feature. I don't see any reason to repeat them. If you are new to this Chanel series, just pop over to the hyperlink "here." I took my swatch photos of this treasure using my new camera body, which seems to pick up green better than the old one did. What I plan to do with the old one is still up in the air. I may just keep it for spare parts. I can imagine spending as much to get it repaired as I spent to buy the new body (which was on sale because Panasonic is about to go to its second generation micro four thirds camera). I used a sponge-tipped applicator to apply all shades fairly heavily, and I took my photos in full, early-afternoon sun. I swatched starting with the green at top left and working clockwise around the quad as I moved down my arm. As I look at the swatch photos, I have an urge to re-take them, but then my knees send me a contrary message. Do eye shadow shades get any prettier? Look at the green at the top of my arm. It is clearly one of the shadows used on the model's eyes above. It offers an element of teal, I think. I'm not sure how to describe it. It offers a gleam - no glitter or sparkle, just a stunning gleam to the lids. It reminds me of shimmering tropical seas. The pink shade is very light and sheer. It is the perfect base shade for use with the other colors. You can also use it as a highlighter under your brows. You might be surprised at how beautifully it enhances the green shades - even from a slight distance. When I first saw the charcoal green, I feared it would be too dark - just another charcoal. It's not. You can see the green in it much better in person than in my photo. It will serve nicely as either a liner shade or a contour shade if applied lightly. The silver green was a surprise. I adore it! I expected "just another silver." Instead, I saw a silver with a slight green tint - stunning alone and with the other shades. This is definitely my favorite of the four Les 4 Ombres Multi-Effect Quadra Eyeshadow quads I purchased. I love them all, so being the "best in show" in a show of full of beauties is quite a distinction. I purchased four of the quads from Chanel's Web site. 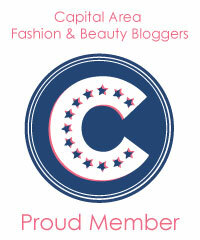 They are winging their way to all Chanel counters and online retailers now. I know from comments that many of you have already selected and purchased your favorites. For those who haven't sprung for one of the new quads, make sure to get a look-see soon.